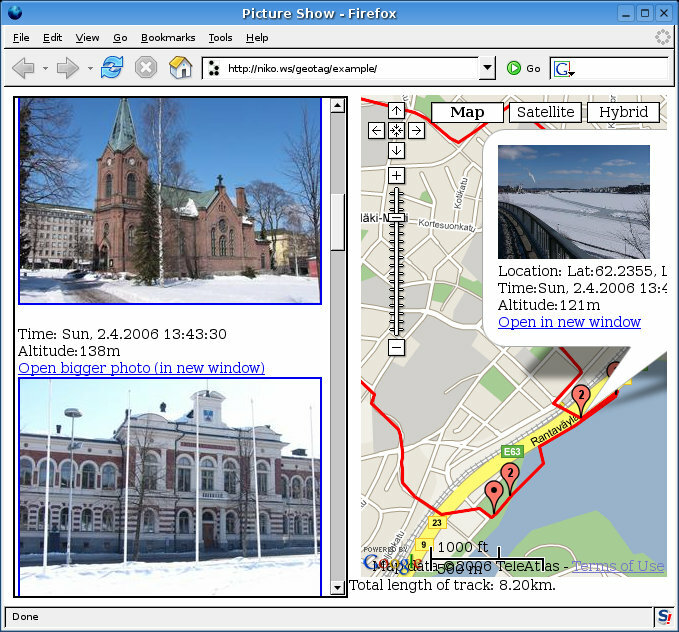 This is a software for displaying photos on top of Google Maps. It constructs a path from data received with a GPS receiver. Then it finds the location of photos (and videos) by matching their timestamps to the timestamps of the path generated from GPS data. See also a live example. This might load for a while because there are so many photos on the page. First you need a GPS receiver, from where you can download your path to a computer. I'm using the Royaltek RBT3000 GPS logger. You also need a digital camera and a Linux computer. First you need to install Python 2.4 with the Python Imaging Library on your Linux computer. Install also jhead. If you want to have video clips on your page, you also need to install FFmpeg and FLVTool2. Then download geotag.tar.gz and unpack it to some directory. Next you should copy the extras directory to your web server somewhere. Then it's time to edit geotag.py to include the pointer to the extras-directory, your google maps api key and the difference between your camera's time and your GPS's time. and wait while it creates you the album to the webpages-directory. has been used when creting the example page from Athens. There is also a web application which is a spin-off of this project, where you can measure distances on Google Maps. It's located here. Another Google Maps application of mine is the hybrid map server. Last update: 18 Oct 2006. Questions? Comments? Feel free to email me.